Today is a dreary, rainy, nasty day. Look at puppy pictures and feel happy. Works for me! I call it Puppy Prozac. Not much can lift the spirits the way a puppy can. How about 8 puppies? Its magic, I’m telling you. Daisy (formerly known as ‘Apple’) is a very sweet little lady. With a perfect temperament score and the makings of an emotionally intelligent and bonded puppy she is an excellent little puppy who is going to make a family very happy later this month. She is a snuggler though she does like to play. A lover, not a fighter she prefers to cuddle over wrestling matches with her siblings. She likes to stare into the eyes of any nearby person in a serious and loving way (her Mama does this as well). Her chubby little face is pure perfection. She looks almost identical to her Mama (at that age) just a little lighter red in color. She is going to be a beauty… of course I don’t produce puppies that aren’t beautiful… and I might be biased. 😉 Daisy is yawning in her open-mouthed picture below and doesn’t it look like she is singing? Butterscotch – is our resident explorer. She is the Lewis and Clark of puppies. Nothing slows this baby down. She is just like a confident toddler on a playground, happily flinging herself down the fireman pole expecting to land on her feet. Haha. Butterscotch has given me a few minor heart palpitations as she launches herself off elevated surfaces, gets her head stuck in gates and railings and has meandered under the couch and gotten wedged in. The lovliest part of little Butterscotch’s temperament is how resilient she is. One little scare or minor accident doesn’t slow her down. She is a little toughie and is just as sweet, personable and loving after a fall or a slide or a stuck-puppy situation. Then she shakes off the dust and is bounding away once more to see what there is to see. She always turns around and looks for me, though. She has crossed large, scary new surfaces just to reach me and clearly this girl will be a bonded, loving dog to her new people-mama. She’s looking forward to the games of fetch and the snuggle sessions on the couch. I guarantee that. She has play sessions to spare and the class miss congeniality award for happy puppies. She also gave us an adorable yawn. Perhaps it was something I said? Boring human-talk going on at the time I suppose. And take a look at her adorable pink and black splotched nose. It is so kiss-worthy. As always click on photos to enlarge. Chai – Our little cream male and the smallest puppy in our litter doesn’t seem to know he is small at all. He is rambunctious and clever and just about as friendly as they come. His little liver colored nose is adorable and his extra-curly coat is going to make for the perfect quality for his people-parents to-be (who are looking to reduce allergies and asthma risks as much as possible). Chai is sweet, fluffy, friendly and beautiful and another excellent example of exactly what a cockapoo should be. Chai is weaning very nicely for such a little dynamite puppy and he likes to curl up in the empty puppy bowl after dinner to have a nap. And yes, we have another yawner folks. I’m telling you, these puppies are a tough crowd! I tell em my jokes and I get yawns. Click on the photos to enlarge if needed. Creme Brulee – This little guy is going to a lovely family (the patriarch of which happens to claim the dessert creme brulee as his favorite… coincidence perhaps? Or puppy fate?) He is another perfect example of a cockapoo. His coat looks just like his mother’s and having seen some of his siblings (from previous litters) look like him I know that he will grow up to be a fabulously beautiful dog. His Mother is so pretty we’re regularly stopped on the street while out for walks. We also get stares… but I suppose that is more about the number of dogs being walked (and the number of kids in strollers or strapped to a back) haha! This little guy is more of a cuddler than an explorer, and like his sister Daisy (aka Apple) he is more of a lover than a fighter when it comes to puppy wrestling matches. But he won’t let the offense of a toy-squeaker being honked at him pass unavenged! This boy loves squeaky toys. He pounces on them and drags them around whenever one comes within range. I see a lifetime love of squeaky plush toys in his future. Our Brulee boy is very friendly and has shown no signs of excessive nervousness or fear or stranger anxiety. He is friendly, outgoing and confident for his age. He doesn’t mind the vacuum cleaner or the various textured surfaces around the house. He has a very serious expression on his face much of the time and he has those sad ‘poo eyes that just about break your heart. He has a very excited family to go home with very soon! Why yes, we did get a yawn. Puppy yawns are the best. And in one photo you can see the little guy tipping his head at me in confusion since I was making all kinds of silly noises to get his attention. There is not much about this guy I don’t love. Click on photos to enlarge. Ginger – I am so excited for Ginger! I knew she’d wind up with the perfect placement. This quiet little sweetheart will be going home to a very loving family in a few short weeks. She will belong to a very sweet, gentle and polite little girl (young lady I should say) and her visibly gentle parents. This little lady is going to flourish in this home environment. Ginger will be staying here for some time to train so I am very excited to work with her as she shows lots of promise and signs of quick learning and retention. Ginger is a gentle-hearted puppy with just a little less confidence than the ideal puppy. She doesn’t show signs of fearfulness to any serious degree or anxiety but she is the kind of puppy that will look to her people for answers in new situations. She may be more unsure of herself and less confident with independence. That is just fine for little Ginger as she’ll have someone around her nearly all the time, which is a blessing for her as many puppies go to homes with working people-parents. It is just a fact that most of us have to work for a living. 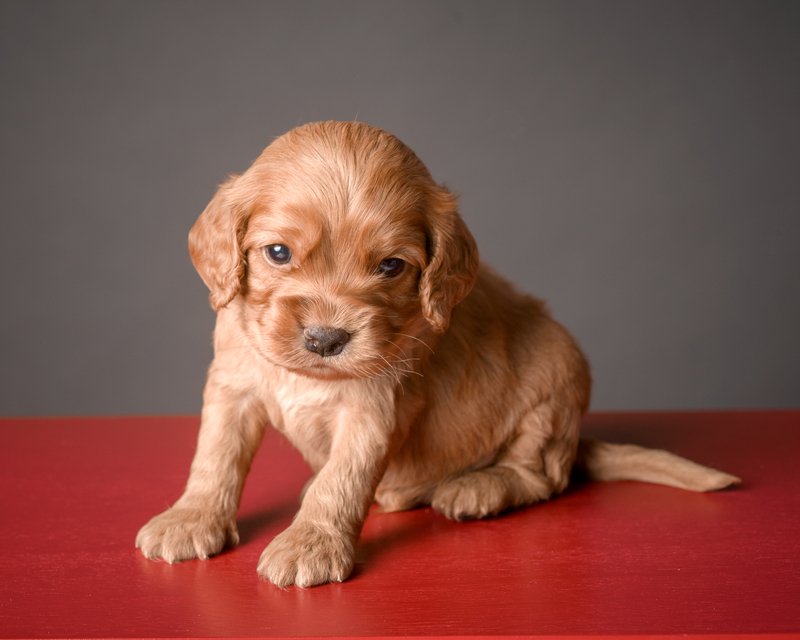 A puppy like Ginger with people around most of the time will feel secure, grounded and will grow plenty of confidence. With ample socialization and a safe home environment Ginger will be a very loving family pet for years. And I cannot wait to see how she looks as she grows. I feel she is going to be a cream and white version of her beautiful mother. I’m excited to see! Honey is just a honey. Click on the pictures to enlarge (and if you’re interested in interviewing to guardian/foster Honey please contact me. She will have her foundation training completed (making her worth about 2k) and she is $100 with a 3 litter contract. Foster homes are far superior to kennel-raising breeding dogs. Honey will very hopefully grow up to be exactly what I’m looking for to continue breeding advanced generations of cockapoos with health and temperaments worthy of the distinction of making excellent therapy, service and family companions. Check out her sweet little white chin and chest and those sweet, sleepy green eyes. Click on pictures to enlarge. Ruby – Is also available to a foster/guardian home though I am honestly going to have such a hard time parting with her. She is a small little sprite like her brother Creme Brulee but is just as mighty as you can imagine. Her happy little tail is always spinning wildly with delight and she jumps around playing with everyone and everything as often as she can. She is outgoing, confident and sweet and is a perfect representative of the ideal temperament. It sure doesn’t hurt that she has a soft, tightly curled coat in a gorgeous deep shade of red. She will be non-shed, bearded and full of personality. She will be on the smaller side and is perfectly proportioned and dainty all over. She reminds me a lot of her half-sister Cleo (now known as Harley) and that just tugs on my heart as Cleo is a very special dog to me. Just look at Ruby’s expression. You can see her naturally inquisitive nature and the way she looks directly at the camera with those loving little eyes of hers. Salted Caramel – is another sweetie that doesn’t hesitate to look soulfully into the photographer/camera’s eyes. This is our biggest puppy and he is just a giant teddy bear like his daddy Jake. This big boy has an absolutely beautiful face and a bearded coat with a gentle, silky curl that will be absolutely beautiful when he is grown up. I cannot wait to see how he looks in a year from now. He is going to be a stunning dog. He is very friendly. When any person approaches the litter he is always the very first puppy to come running to the front to greet the visitor. He is the biggest mush around and wants to cuddle in every lap. He does enjoy chasing balls and pawing at them (perhaps he thinks he is a giant kitten?). Salty loves to cuddle but I’ve never seen him cuddle in quite the way he did when he met his soon-to-be forever home. There was one pretty young woman whom he snuggled right up with. I’m telling you, he picked her. And that was it. Love it was! He is going to be a very happy puppy when he goes home. He is mellow and easy-going and is a roll-with-the-punches kinda dog. For most of us busy people that is just what the doctor ordered. He is less likely to destroy things during teething periods and in general as well as less likely to make his owners crazy with nearly non-stop requests to play fetch. His energy level will be perfect for a nice walk or a couple games of fetch or tug-o-war but this isn’t a puppy that requires a 4 mile jog every day (which is going to be appreciated by his new family come the freezing winter months). And who can resist those little white socks on his back feet and white toes on his front paws? Click on the photos to enlarge. Thank you for looking at our photos. If you’d like to see the group pictures we have of these puppies please click HERE. 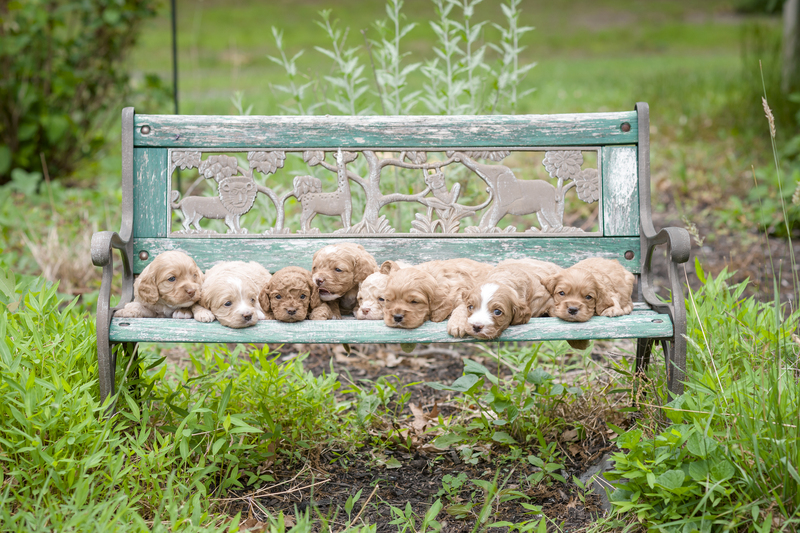 This entry was posted in 2015 and tagged 2015, cockapoo, puppies, puppy. Enter your email address to follow Eden's Autumn and receive notification of new posts by email. Mother to five blessings and wife to one. And I am a small scale breeder of dogs used primarily for service, therapy and family pets. I train dogs, groom dogs, write about dogs and absolutely adore dogs. I'm your dog-guru and apart from family pretty much every other 'interest' takes a back seat to my four-legged furry loves.